If you purchased a Sennheiser ME 3 microphone elsewhere and you noticed the plug on your microphone has a rotating "locking ring", you have probably found that the microphone isn't working, or works only sporadically depending on the connection. The issue is that locking ring prevents the non-standard plug from fully engaging when plugging into your sound card. We have created this exclusive adapter that converts the plug with the locking ring on the regularly distributed ME3 to a standard 1/8 inch (3.5 mm) plug. These are manufactured specifically for Speech Recognition Solutions and are guaranteed for 1 year but should last at least as long as the microphone. Please note: If you purchase a Sennheiser ME3 from Speech Recognition Solutions, it is an ME3 that comes from Sennheiser with a standard plug and it is not necessary for you to purchase one of these adapters. 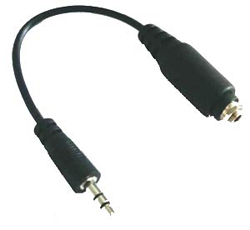 Additional Note: this adapter does not change the unusual wiring scheme used by Sennheiser in the manufacture of the ME3. The ME3 is not compatible with all sound cards. If you are having trouble, we recommend you interface your ME3 with an external USB sound adapter, such as the Andrea Pure Audio (MA) adapter, Buddy 7G or the SpeechWare MultiAdapter. From Tim Olson of Jenks, Oklahoma on 11/23/2015 . I have two me-4 and one me-2 mics from Sennheiser wireless kits. I don't want to use wireless all the time and this allowed me to go right into the Andrea USB adapter with good sound. The alternative is an $150 adapter so this was the better option. From Anonymous of Bellingham, Washington on 1/15/2015 . From Jon Wahrenberger of Hanover, New Hampshire on 11/15/2013 . Unless you bought your ME3 from this company, you will need this simple adapter to convert the non-standard plug on your ME3 to a standard 3.5 TRS plug. This is well made and appears durable. Does it work with ME2? Response From Speech Recognition Solutions: We do not carry the ME2 microphone, so we are unable to test this combination. However, looking at a photo of the ME2 lavalier microphone, it appears to have the same locking ring connector as the ME3. Therefore, I would expect that the ME3 adapter should work with the ME2 lavalier microphone. 9/10/2016 – Does this work with the ME 3 II microphone aswell? Or is that one different? I bought the microphone here in Norway (Europe). . . . Response From Speech Recognition Solutions: Yes, the ME3-II uses the same locking ring as the prior model, the ME3-EW, so the ME3 adapter works just as well with the ME3-II. 9/11/2015 – I don't suppose you know where I can get hold of one of these in Europe? Response From Speech Recognition Solutions: Unfortunately we don't have any distributors for our product in Europe. There are some similar products listed on Amazon, so you might be able to get one from a local reseller through this outlet.